Looping State of Mind, another record of top-tier maximalist minimalism, vaults the Field's Axel Willner from burgeoning, brilliant protégé to titan in one fell swoop. Another two years, another off-white slab of top-tier maximalist minimalism from Axel Willner, who began the Field in 2005 as an extroverted take on Kompakt’s ambient techno of the day. 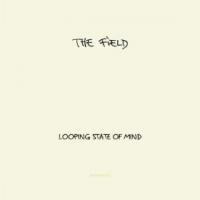 In a certain way, Looping State of Mind is a reliable repetition in Willner’s career, much like the loop itself, which has represented the Field’s most fundamental form of expression. In techno, and certainly in the Field’s case, the loop provides an illusion of unbridled continuity, which allows the listener to relax -- on the dancefloor, or on the bus ride home -- and give in to the groove. Willner understands, however, that the loops must develop to remain engaging; their progression seems to work on the part of the brain that doesn’t pay outright attention, but still notices the changes happening. Such is the case, also, for whole albums in an artist’s oeuvre, and Willner knows it. You find these changes in the Field’s latest opus: songs slowly expanding, melodies subtly becoming more advanced, the volume growing more forceful by the minute. It’s apparent, too, that Willner has gotten defter at making his developments sound natural. Yet what strikes me is how Looping State of Mind feels so essentially like the work of the Field and no one else, even as he renders it a different animal by intention. Initially a solo flyer, Willner gained a band -- Dan Endqvist and multi-instrumentalist Andreas Söderstrom -- and moved from his native Stockholm to Berlin to record his second album, Yesterday and Today. For Looping State of Mind, he replaced Söderstrom with a drummer, Jesper Skarin, pushed vocal samples into the foreground, added acoustic instruments like double-bass, and recorded it all with the embarrassment of riches in Kompakt’s Cologne studio. To offset these switches and upgrades, Willner claims that some of the album’s core ideas date back to his debut full-length, and that sounds like the truth to me. This three-piece seems far more comfortable than the one on Yesterday and Today, which sometimes crammed itself into the ears, and ambient heavy-hitter Jörg Burger mixes the record with sensuality and boldness as top priorities. As a result, each song is a gorgeously flowing sound field, filled with so many creative sonic gems that mere words fail laughably to describe them. Nonetheless, I’ll try. “Is This Power” rides a beefy synth-and-bass-laden groove for almost nine minutes without flagging, but the next track, “It’s Up There”, practically screams ambition. It is -- it must be said -- about as close to perfection as the Field has ever come, starting as an arousing Seefeel-esque loop over compressed kicks and pumps, and then flourishing into an anthemic dance number for the sophisticated Europhilic crowd. “Burned Out” builds its loop from a 1980s-R&B guitar pluck, somehow blended beautifully with choir “aahs” and a New Wave vocalist trying to be heard over worn-out tape. The title track, meanwhile, is a percussive delight, where Willner and drummer Skarin bring Western and non-Western drumming into a communicative dance. Willner tips his hat to mentor -- and then admirer -- Wolfgang Voigt more than once, and not just in the kick drums. Two elements from Voigt’s Gas project reappear in “Arpeggiated Love”: the inflating trombone from “Funf” and the ringing guitar-based bell in “Pop 4”, winking at each other from within the same song. And the sultry finale, “Sweet Slow Baby”, re-imagines Gas’s starry, off-balance early recordings for the 21st century. Yet for every nod toward his obvious forebears, there’s something that points to Willner’s individual growth. “Then It’s White”, with its ghostly moans and raw acoustic piano in an emotionally naked atmosphere, takes an idea promulgated by British experimentalist Robin Storey and crafts it into the Field's own circular creation. It seems almost sacrilegious, but the ears don’t lie: From Here We Go Sublime, universally lauded as one of the 2000’s best albums, sounds thin and just a little bit empty next to Looping State of Mind. It’s the album that vaults him from burgeoning, brilliant protégé to titan in one fell swoop, and it hints at even greater things to come as he continues down the path of total artistic realization.